Australian dollar gold price has recently broken out to all time highs, and the thesis on gold remains very much intact. It’s a very good time to be an Australian gold producer. In this wire, we look at the sector from a bottom-up perspective to see where there is relative value. We allocate capital to gold (as we do with other sectors) on a relative value basis. Particularly with cyclical stocks (or commodity exposed stocks) we primarily allocate capital on valuation grounds first, and then determine the asset quality, management quality and any insights we may have as to the operations of the company. Based on the above framework (click here for larger image), which assesses each gold company using the same assumptions, we currently hold our biggest gold position in Gold Road, which has been one for the patient. 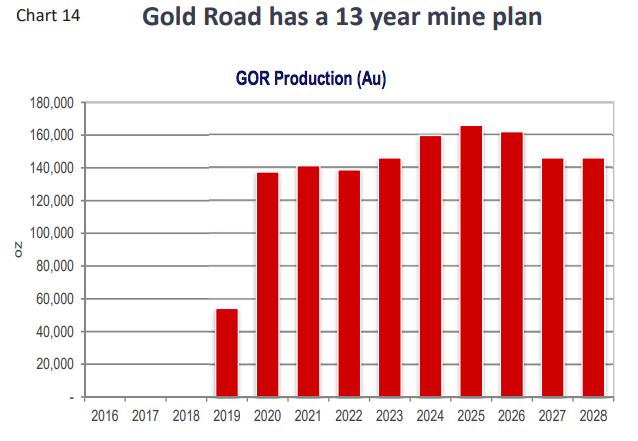 Gold Road owns 50% of the Tier 1 Gruyere Project in Western Australia having first discovered the project in 2014. Gruyere has the largest reserves (3.5moz) of any single Australian gold mine. Goldfields (South African company) then paid them A$350m for 50% in 2016, which has effectively funded 50% of the plant construction cost (approx A$625m). The plant is in the final stages of construction and will start producing gold as of the June quarter 2019. We are attracted to Gold Road because of the long life nature of the open pit operation. The mining operation is relatively straight forward, with a very low strip ratio (digging out ore from surface) and while the reserve grade is relatively low (1.2g/t) the consistent nature of the ore body across 2.6kms should mean consistent feedstock for the plant. We have watched Regis Resources (RRL) commission Garden Well and Independence (IGO) commission Tropicana with the same mining process and plant design. While it is impossible to alleviate all commissioning risk, this plant should be relatively straight forward. We are also attracted to the advanced exploration work Gold Road is doing around the Gruyere project (6000kms), which could add significant value to the operation should they discover another large ore body. We expect the share price to rerate once the operations are up and running as it has been a significant laggard to the rest to the Australian mid cap miners. Hence Gold Road is trading at a significant discount to our NAV, and the 13-year mine life from open cut mining gives us confidence in the long duration nature of the project. It is why we prefer Gold Road to the other small/mid-cap gold producers which have less certainty around their reserve base and minelife. 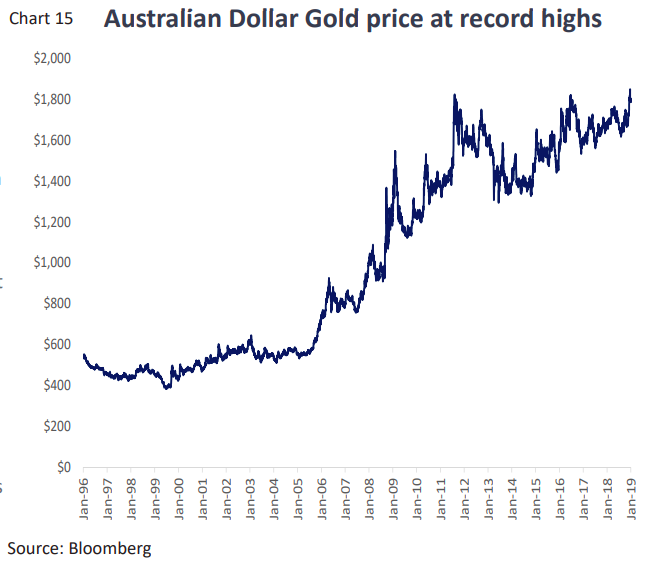 The chart below also highlights that gold in AUD terms is at record highs. All else being equal, margins should be at record highs as well. We have been of the view that yes, the Trump tax cuts have delivered a sugar hit to the US economy driving a cyclical upswing in employment and confidence. 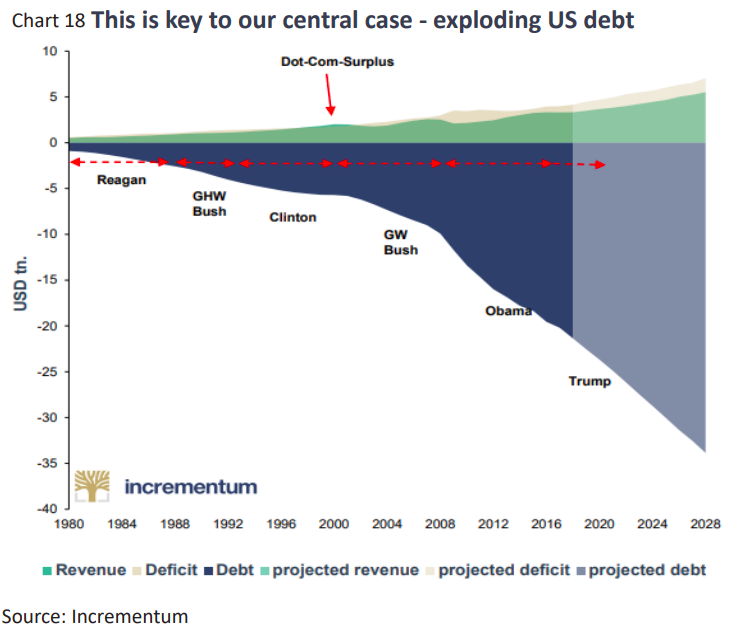 Our enthusiasm is dampened however, by chart 18 below, which highlights just how precarious the US debt position will become over the next 3-5 years. So we have always had the view that interest rates rise through a cyclical upswing, but structurally, they have to (we believe) remain significantly lower for longer in the US simply because of chart 17. The US federal interest bill has doubled in 15 years, and will double again over the next 10. 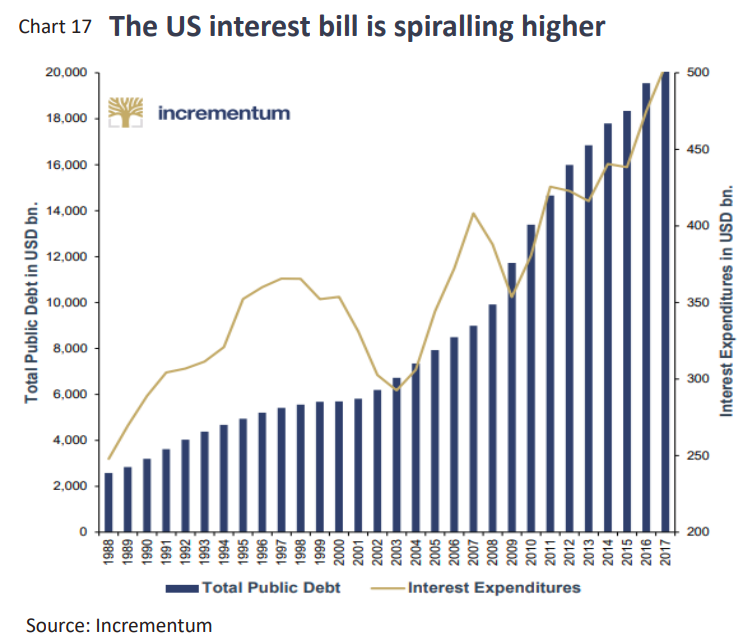 Yes, on current projections, the US interest bill will be over US$1.0 trillion per annum in 2028 (at 3.0% interest rates). Hence our structural view of lower interest rates. This thesis has no way of interpreting how high the US 10 year yield might reach over the next 12-18 months as Jay Powell seems intent on raising the US cash rate as high as possible before the US economy needs more fiscal easing. (Note his tone changed somewhat in January). The unusual aspect of the position we find ourselves in at the end of 2018 is central banks balance sheets are starting to contract, a position financial markets haven’t experienced since the mid 1990s. This is the key “black swan” event markets have to navigate over the next 12-18 months. We believe this will have a bigger impact on markets than any trade war may have. Of course, predicting exactly how this may eventuate is nigh on impossible as all forecasts are prone to new data. We are in the camp that believes should asset markets continue to be too dislocated, then it is entirely reasonable that the US reverses its QT (balance sheet contraction) and starts providing liquidity again. This would be viewed as positive for risk assets, but a tacit acknowledgment that the debt problem is only solvable by inflating assets to offset the debt component. So while many commentators remain concerned with the level of Chinese debt (in aggregate), we believe the US economy has been just as proliferate over the past 40 years. 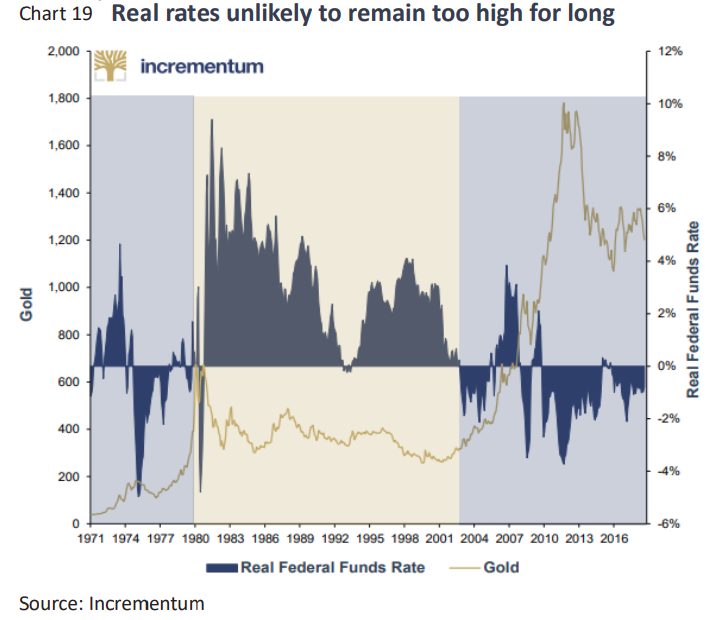 Chart 19 below highlights that gold historically outperforms when real fed rates (the US cash rate less inflation) is negative (the opportunity cost of holding gold is zero). Gold has suffered relative to other asset markets over the past 3 years due to the expectation that US real rates turn positive (we expect they will). The question remains, how long for if the US government can not afford materially higher interest rates? We have always invested a portion of the fund in gold equities for the reasons outlined here. This thesis remains well and truly intact. What is "Insight score" in the table?